Listen into our radio for the "BOLLYFM TOP 10" radio show hosted by RJ Swapnil with new celebs on new week. 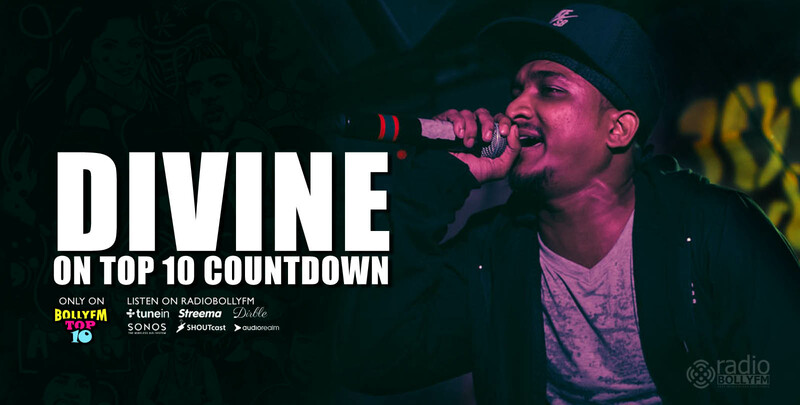 DIVINE is an award-winning rapper & hip-hop artist from Mumbai, India. Born and brought up in the ‘gullies’ of Mumbai, DIVINE has come to be known as ‘the Voice of the Streets’ - narrating tales of the people that he's grown up observing since childhood - and paying homage to the characteristics of the city. Vivian Fernandes aka DIVINE came into the limelight when his award winning 2013 release “Yeh Mera Bombay” went viral and thereafter received a lot exposure on local radio stations across the country as well as international platforms such at Beats1 Worldwide and the BBC Asian Network. His 2015 summer-smash “Mere Gully Mein” was not only honoured as the BEST VIDEO OF 2015 by Rolling Stone India, it also established him as one of the premier hip-hop acts in India and garnered him an international listenership. This further escalated DIVINE when he was titled BEST NEW ARTIST 2015 by iTunes and Apple Music in India and as one of the top ARTISTS TO WATCH-OUT FOR IN 2016 by the BBC Asian Network.